Chicken tikka can be used in so many different recipes! My Latest and Favourite Chicken Tikka Recipe is in my New Hardbound Cookbook! I remember last year’s World Curry Festival in Bradford. I was walking around checking out the food stalls and noticed a very long queue in front of Hasan’s stall. That day they must have served tons of chicken tikka to hungry visitors! I ordered mine served on fresh naans. Those succulent pieces of chicken were to die for. The thing is, it’s not difficult to make chicken tikka at home. It’s nice to go out to dinner and get spoilt with gorgeous food but let’s face it… that’s a real treat. When at home I like to make chicken tikka for the family. The kids love it and as all the fatty skin is removed so it’s also quite good for you. There’s nothing like firing up the tandoor oven – a little birthday surprise from my wife – and cooking the tikka until they’re just cooked through and lightly charred on the outside. This recipe could also be made on a barbecue or even in a hot oven. The meat can be served on its own or used in curries. Chicken tikka masala anyone? I love the smoky flavour barbecued chicken tikka adds to my curries. 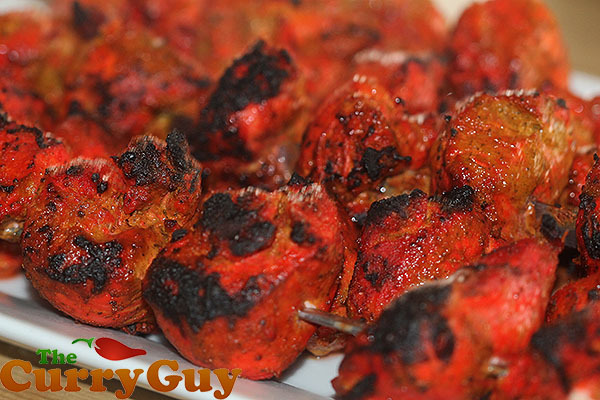 There are many different great chicken tikka recipes out there. Here is one of mine. Enjoy. Some of the ingredients you need to have on your list. Free range chicken is always best! 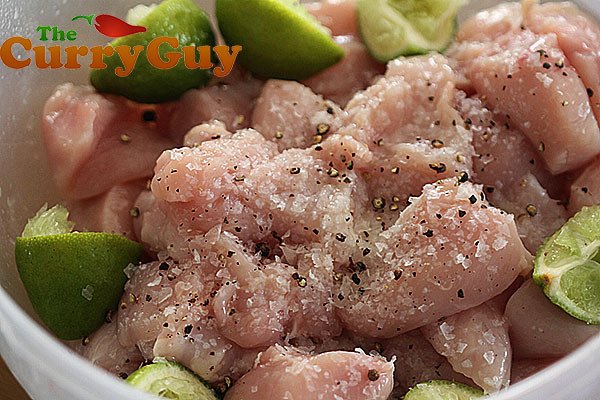 Chicken marinating in the lime juice and salt and pepper. Add the red food colouring powder (if using) to the first marinade. Blend all the second marinade ingredients. 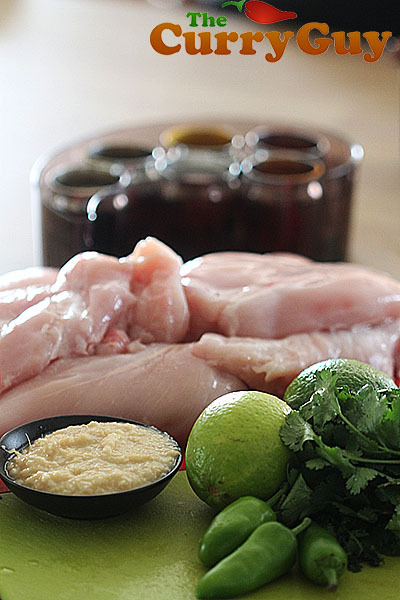 Rub the blended marinade into the chicken pieces and allow to marinate for 3 to 48 hours. Allow to marinate for 3 to 48 hours. The longer the better. 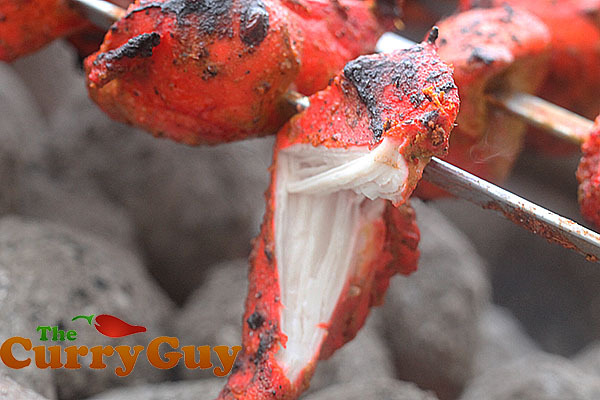 Kebab grills are perfect for making chicken tikka. 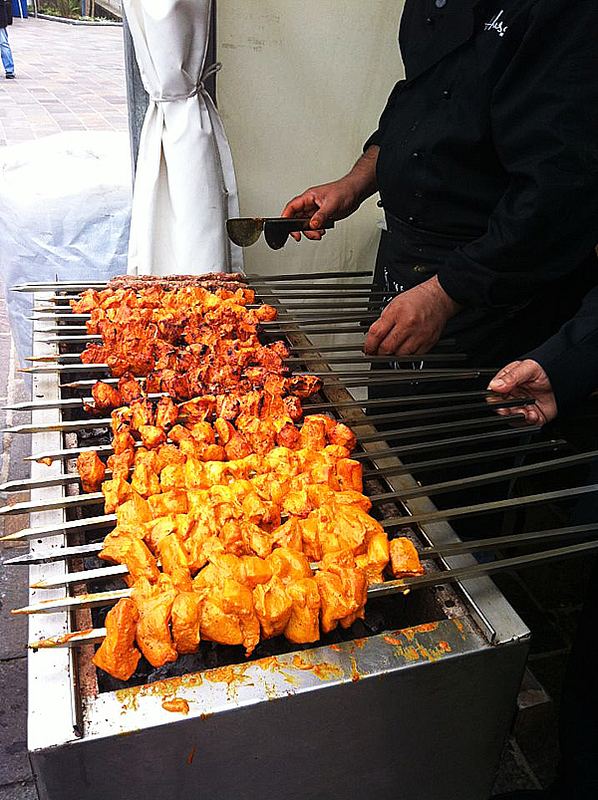 Cooking on skewers chars the exterior while keeping the meat so moist and tender. If cooking in the oven, set your oven to the highest heat. Place the chicken pieces on a rack and cook for about 20 minutes. Turn the pieces half way through the cooking time. The chicken is ready when the juices run clear when pricked with a fork and the edges are blackened slightly. 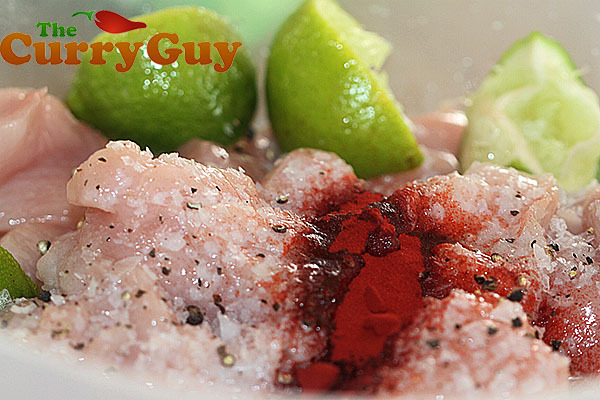 Place the chicken tikka in a large bowl and squeeze the lemon juice over them and sprinkle with a little salt. Now, place all the marinade ingredients in a blender and blend to a fine paste. Cover the chicken pieces with the marinade ensuring the chicken tikka are completely coated with the marinade. Allow to marinaded for six hours or up to 48 hours - the longer the better. When ready to cook, light a barbecue. Gas barbecues will work but I prefer the flavour of charcoal barbecues. You are ready to grill when you can hold your hand two inches above the grill without it being unbearably hot. 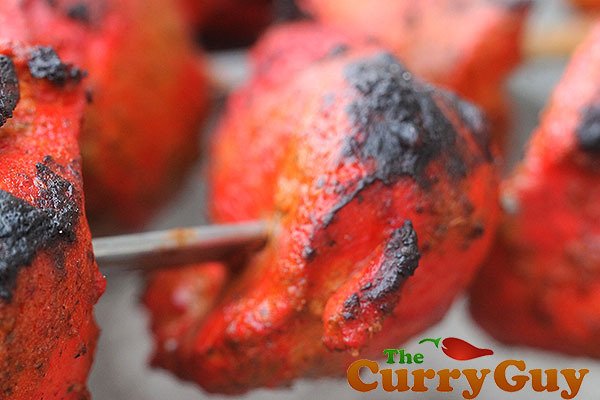 Cook the chicken tikka on skewers turning occasionally until the chicken is cooked through and the edges are blackened. Hi Dan,first of all,what a great site ,you have done a great job,i bought your e-book yesterday and this week about to make a batch of your large base sauce,my first dish i will attempt will be your chicken jalfrezi,im looking for a simple vegetable curry recipe to accompany a biryani or tandoori chicken,i will let you know how i get on with the jalfrezi. Thank you very much for buying my book. Hope you enjoy the recipes. Happy cooking. Here’s a question for you. I want to make a dairy-free Chicken Tikka – and suggestions how to make this without yoghurt?? There are so many ingredients in this so you really could just leave the yogurt out and still have a good marinade. Good luck. 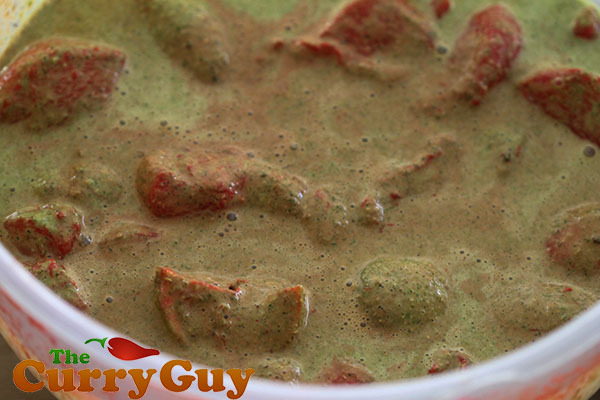 I use the thick part of a can of coconut milk for my “yougart” marinades and it works nicely. Good luck! I use the thick part of a can of coconut milk for my “yogurt” marinades and it works nicely. Good luck! You could but it would taste completely different. It would still be good though. The yoghurt is there as a meat tenderiser but chicken is usually quite tender anyway. Give it a try. What does the citric acid powder do? Is it essential ? Citric acid powder is really tangy. Lots of restaurants us it. The more traditional way of getting that flavour is using mango powder (achoor powder) which is available in Asian shops. Hope this helps. I have got mango powder, is the amount the same as citric acid powder I.E. 1 teaspoon? That should be fine. Good luck. Also why is the chicken so red – food colouring? I’m not sure if you are asking but if you are, yes, you can use amchoor powder instead of citric acid powder. It is much more authentic. The meat is read from food colouring powder which adds no flavour. It is only there for appearance and can be left out. Thanks for your lovely recipes. I really loved your Chicken Corma recipe. One question, I think its ( amchoor powder ) which you might be referring to, in one of your earlier reply ? I can’t find the reply you are referring to but yes, amchoor powder can be substituted for the citric acid powder. It is much more authentic. Thank you very much. I’m really glad you liked the korma recipe. Hi Dan your picture show limes but your recipe says lemon does it matter which one thanks loving the recipes . I’ll have to have a look at that. I use both. Whatever I have on hand. Hi Dan, great site! I just have a couple of questions, at the start of the ingredients you have “tablespoon of salt” and then further down there is “teaspoon of salt” Is the tablespoon of salt just what you would sprinkle on the chicken with the lemon at the start and the teaspoon is what goes directly into the marinade? I was also wondering how you get red colour? When I made this, the marinade was green? Lastly, is it possible to use chili powder instead of fresh green chilis, if so how much should I add? Thanks and keep up the fantastic work!! Thanks for your question. If you look at my photos, the marinade is green. The chicken is marinated first in lemon juice, salt and red food colouring which is optional. The food colouring has no flavour but it helps achieve the curry house chicken look. As for the salt, I have adjusted the recipe to one teaspoon (more or less to taste). 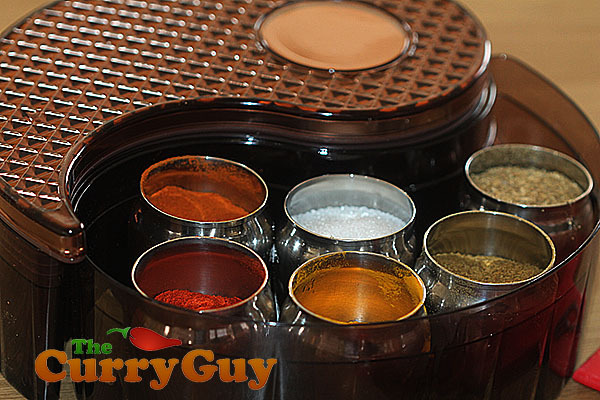 As far as the chilli powder goes, choose one with a heat level that you like. You could definitely use chilli powder instead of fresh chillies but the end result will taste different. Be sure not to add too much if you are not a big spice fan. Great blog! I’m just starting out trying your recipes, but have a few questions. With Tikka chicken, like Jonny, I’m also confused regarding the salt. As Jonny noted, the recipe lists salt twice: 1 Tbs early on, and later a tsp which is listed as ‘optional’. I think Jonny’s question was asking whether one should add at least 1 Tbs (as listed in the first part) and then choose to add up to 1 tsp more, or is there an error and one of these amounts or steps is a error? Can you clarify if tyour are saying the minimum is 1 Tbs, and whether you should it go in early like a rub, or later etc.? As to the rest of the recipes, any chance you adjust your recipes to read in grams at some point? I’m in the US and have learnt that a Tbs, tsp, cup, pint, gallon etc. are very different in different countries. This can result in a totally different result with flavours being way off. Thank you. I’m afraid the blog is kind of on the back burner these days so I won’t be updating old recipes. Unfortunately, I just don’t have the time. I might though when my schedule quiets down. Just use salt to taste. My recipes are really just recommendations that you can use as guides. First of all I would like to thank you for your great site. I already made a large batch of your BIR base curry some while ago and tried the Madras and Korma which where a huge success at home. Now I would like to make the Tikka Masala. I have several questions related to the tandoori chicken recipe. First of all, is it reasonable to make a large batch of chicken and then deep freeze post of it for later use, without affecting the quality and taste? Second, the typical red colouring, can it be obtained otherwise than by using food colouring? I have some Wilton Icing colours at home that I use for colouring kakes. Could this one be used as an alternative to the powder you mention in the recipe? Thank you. The chicken can definitely be cooked and frozen for up to two months without losing much flavour. I do this all the time. As for the colouring, you could just leave it out as it adds no flavour. You could also try using beet root powder which I use from time to time. It isn’t as red but still works nicely. This chicken could also be shallow fried in a pan but you will not achieve the same tandoori flavour. Barbecues work really well. Hi Dan, been looking for a good tikka recipie for years now but still struggling. Did you not find that by blending the yogurt that it becomes very watery? or are you doing this intentionally ?? This has been my experience when making dips etc. Good site and keep up the good work. His. Is your book only available on Kindle.? For now. You can download apps though to read them on other devices like iPad, iPhone and Android phones and tablets. Hope this helps. 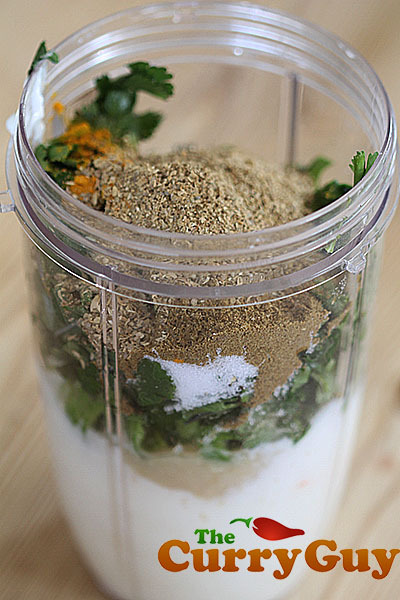 Are you using a nutribullet to grind your spices? I haven’t tried that one. No, I use a Waring spice grinder. Love it. Hello, on these pictures is some red powder. What is it please. It’s just red food colouring powder. It is only for appearance and adds nothing to the flavour. What do you do with the marinade? Can you use it in the curries or do you just throw it away? Made two curries last night, best yet, thank you. You can add the marinade to the curry. As it is yogurt based, be sure to add it slowly. 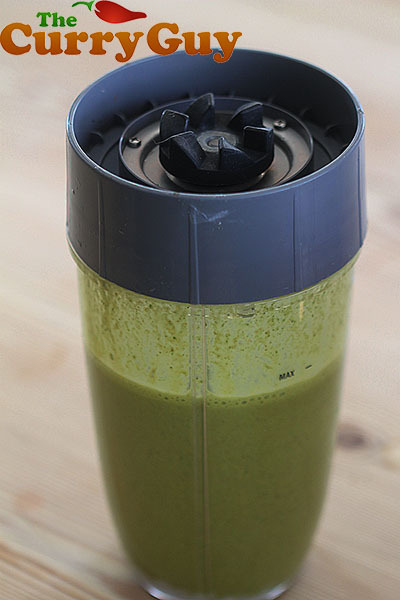 One tablespoon at a time and then simmer until cooked so you don’t have any raw meat juices. Hi I have some cooked chicken…can I still marinade? No, once it’s cooked it won’t marinate very well. Been looking through your site and very tempted to buy the book but thought I would try a recipe 1st to make sure the recipes are restaurant style. I thought I’d try the Chicken Tikka as it’s one of our favourite starters. 5th Photo shows the limes in a bowl with chicken and what looks like salt & cracked black pepper, the cracked black pepper isn’t mentioned. Recipe doesn’t mention how long to leave the chicken marinating in the food colouring, limes, salt & pepper but when shown in the 2nd marinade the chicken is VERY red as if marinated for some time. Thanks for noticing. It’s really difficult to cook while photographing. I’ll try to get that fixed next time I cook the recipe. Made so many curries from your website, it’s amazing often get asked by guest if I have bought this from a curry house and served it up, Thank you love the tandoori chicken recipe my favourite . Really glad you like the recipes. Thanks for stopping by. I’m thinking of baking in the oven with foil wrapped around it, I guess it won’t give the chargrill effect but should still work perhaps? Thanks! It will still work and no you won’t get that char but it still tastes great. Have not tried it but it seems a lot of work, ingredients and mess to make the marinade , surly a shop bought one would be just as good as it has all the same ingredients. Most restaurants use pateks sauce as well. Thanks for stopping by. I’ve seen so many recipes, some including mint sauce. I’m not a big fan with chicken but add it if you like. I like to look at my recipes as guides which you can add to. Enjoy. 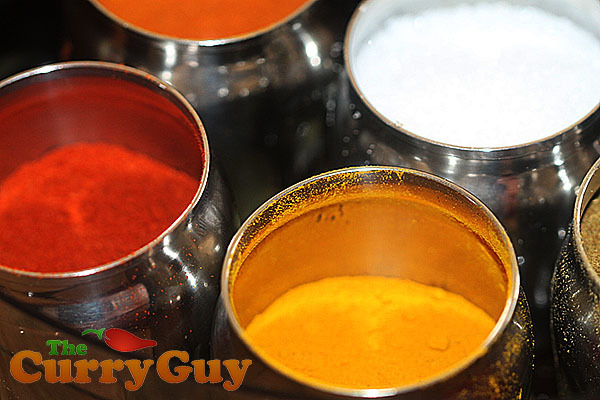 I am going to make the tikka masala and was wondering if you have tried adding ground almonds to the recipe? I was under the impression from Indian restaurant menus it was an integral part of the dish we love! Thank you very much. Yes I have used ground almonds in my chicken tikka masala. It isn’t in the recipe on my blog but will feature in my printed cookbook, out May 2017. Try adding about a tablespoon ground almonds to this recipe. You could add a little more if you like. Thank you for your question. First I would like to stress that this recipe needs some work. It will work but I have improved it over the past few years. Garam masala is not used in this recipe but a tablespoon or so certainly wouldn’t hurt. these days a blend all the marinade ingredients first and then add them to the yoghurt. Then I mix the into a smooth emulsion by hand. It works much better but this recipe does work fine. Good luck and hope you like the recipe. Hi Dan how many spoons of the red food colouring do you use? That’s a personal thing. I’ve seen chefs use loads and thought the end result looked terrible but they were happy with it. I only use about a half teaspoon or teaspoon. I suggest adding just a pinch and then adding more until you are happy with the colour. Good luck. North of the boarder we have Pakoras for starters, but they do not have them in restaurants south of the boarder, only onion bagees. Do you have Pakoras recipes in your new book for them ?? We are curry mad and could eat it every night. I am going to have another go at the Base sauce as have been a little disappointed with the resulting curries. Hers a a strange one, made the vindaloo from your low fat book, and it’s the best curry we have made in 3 years off trying, the taste was brilliant. One more thing, we cook our tika on metal skewers in a gas oven, the taste is great but it is always dry. Any tips on how to stop this. We probably cook it for about 30 to 40 mins. Sorry to hear that you have been disappointed with the base sauce recipe. It is very authentic as I have seen it made amy times at restaurants. I’m not sure what went wrong but often people don’t like the flavour of fenugreek. Try leaving that out and see what you think. With regard to the chicken, it really depends on what size you cut your chicken pieces and the meat you use. Normally, chicken breast is used as it looks better. Chicken thigh meat isn’t as pretty but it is a lot juicier and has more flavour. Be sure your oven it pre-heated to its highest setting. I think you might be cooking the chicken too long. It only needs to cook through. If you continue to cook it after it is fully cooked, it will dry out very quickly as there is very little fat to keep it moist. You could baste it with butter which is very nice but of course adds calories. Thanks Dan, will definitely be trying again. I am going to order your hardback as a way of thanking you for all your tips. Going to make the Lamb Dhansak today but wanted to substitute the meat with chicken. Would this be OK? I notice the recipes make reference to a tablespoon of ingredients. I had thought tablespoons vary in size as mine is absolutely huge. What’s the best way to get round this? I notice 15g is equal to a tablespoon – should I use this? Thank you. Yes, chicken can be substituted in the dhansak. It doesn’t need to cook nearly as long. Just cook it until cooked through. I use 15ml tablespoons but to be honest, I rarely measure things out at home. If you think a measure looks like to much, just add less. You can always add more to taste at the end. hi dan,i have been making curries for years,but there was always something missing.just bought your book,the curry guy a couple of weeks ago.it’s the missing link iv’e been looking for.your base sauce is brilliant,i’ve tried a few different base sauces in the past but no others compare to yours.. thanks a lot. all my curries are tops now. Thank you very much for buying my book! I’m really happy you are enjoying it. Much appreciated. My love for chicken guarantees me to try this recipe tonight,tonight! I was just wondering, should I leave the lemon/salt juices with the chicken when adding the yoghurt marinade? Or should I pour it off first? Leave it all. The lemon juice and salt becomes part of the marinade. Hi does the tandoori chicken tikka have to have citric acid powder as I’m struggling to buy it ? It doesn’t have to have it. The citric acid powder offers a nice tangy citric flavour. You could use amchoor (dried mango powder) instead in the same amount. You could also just squeeze a little lemon or lime juice over the cooked chicken. Hope this helps. Just bought your hardback book and made the Chicken tikka, currently in the fridge. Noticed that the method and ingredients above are completely different. I guess that is the beauty to Indian cooking there are so many different ways of subtly changing tastes and textures but cooking the same thing. The marinade in your picture for this recipe is green, however the one I’ve just done is a very light brown. Either way, the marinades should still work really well and taste great. The recipes in my book are different to those on my site but all are equally authentic curry house recipes. Thank you very much for purchasing my book. I hope you enjoy the book and recipes. Thanks for the recipe. Can I use paprika powder for colour instead of the actual food colouring product? You sure can. 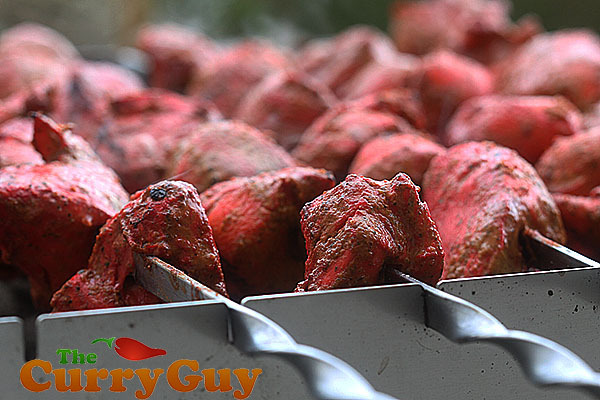 The food colouring adds no flavour but gives the meat the authentic tandoori appearance. You won’t get that from paprika but to be honest, I rarely use food colouring. That is great to hear. Thank you so much for picking up my book. I’m really happy you are enjoying the recipes. It shouldn’t be dry at all when cooked this way. You might have over cooked it a bit. One thing you could do, however is baste it with melted ghee or butter while cooking which will help. Hi Dan, my names Rich, I was just wondering about the recipe it says lemon juice but in the images your marinating the chicken with limes… which one works best limes or lemons..
your base curry sauce is amazing. In the recipe I usually use lemons but you could use limes. They are both fine! Yes! Put it in whenever. That can be put in at the beginning or end of cooking. Where did you get your barbeque and skewers from? I am looking to purchase a similar one? I have a large collection. Most I picked up at Middle Eastern and Asian shops. The skewers at the bottom of the post came with my kebab BBQ which was supplied by Thuros. This recipe is very good. I used lemon and lime juices and left for 54 hours. The end result, one of the best tandoori chicken I’ve had. Well done sir, I take my hat off to you! Thank you very much for that. I’m really happy you enjoyed the recipe.